Download a blank fillable Dd Form 2903-2 - Voluntary Separation Incentive Pay Agreement Bi-Weekly Installment Payment in PDF format just by clicking the "DOWNLOAD PDF" button. 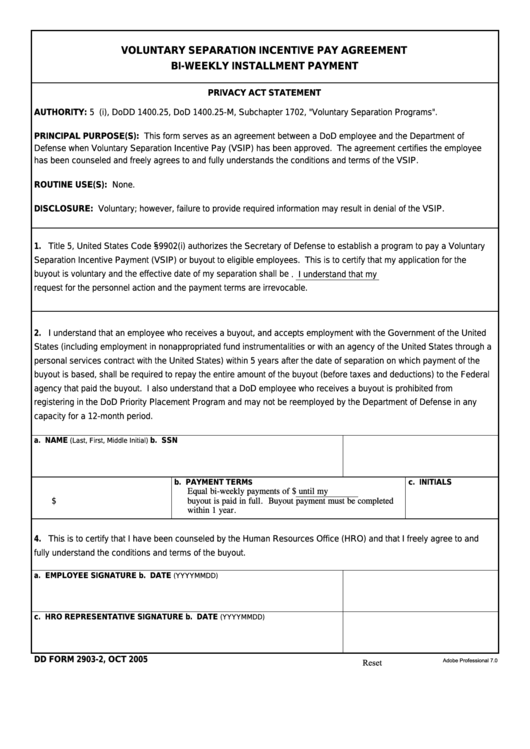 Complete Dd Form 2903-2 - Voluntary Separation Incentive Pay Agreement Bi-Weekly Installment Payment with your personal data - all interactive fields are highlighted in places where you should type, access drop-down lists or select multiple-choice options. has been counseled and freely agrees to and fully understands the conditions and terms of the VSIP. DISCLOSURE: Voluntary; however, failure to provide required information may result in denial of the VSIP. request for the personnel action and the payment terms are irrevocable. capacity for a 12-month period. fully understand the conditions and terms of the buyout.